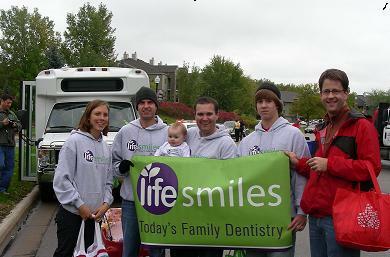 Friends and Family of Life Smiles Dentistry of Plymouth, MN have been extensively cross-training for the strenuous 1/4 mile walk on Plymouth Boulevard for the 2011 Plymouth on Parade event. Come enjoy the fun on September 24, 2011 at 11:30 am. Dr. Geisler plans on bringing over 1000 kids toothbrushes to give away. We hope they all fit in the Radio Flyer wagon! The photo above was from last year and it was a little chilly. We are hoping for 70 degrees and sun!